Incorporating Antiques: Through the Eye of an Interior Designer | Skinner Inc.
Join us for an Evening with Phillip Thomas on October 12, for a Q&A on Incorporating Antiques: Through the Eye of an Interior Designer. Skinner is excited to have had the opportunity to collaborate with interior designer Phillip Thomas—an ideal platform to showcase Phillip’s talent for seamlessly mixing an eclectic combination of antique objects, furniture, and works of art, all inspired by the property in this auction. 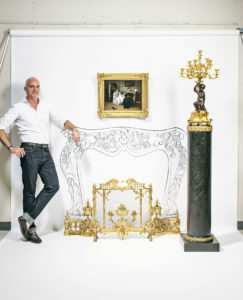 Phillip artfully shows how to incorporate antiques in today’s interiors. This event is held in conjunction with the European Furniture & Works of Art auction on Saturday, October 13. This entry was posted in Blog, Event and tagged art event in Boston, boston free event, collaboration in design, european antiques, european auction, european furniture, gallery talk, home design, interior decor, interior design, interior design with antiques, interiors, Phillip Thomas by Skinner. Bookmark the permalink. Really appreciate that coming from you, Thank You. Good Article to read about, I really enjoyed your article. I think the most important aspect of decorating your home is that it reflects who you are, your personality.